Early in 2005, I got a call from a very personable auctioneer, named, "Wes." It turned out that, although, we had never met, we had many mutual friends in the world of antiques. Aside from his regular career as an auctioneer, Wes had become a TV personality, one of a "Team" of “Detectives” who solved mysteries, seeped in history, weekly on Public TV. The way the show unfolded was well established, by, this, its second year. A member of the general public, not unlike those who appear on the Antiques Roadshow, presents a mystery to the Team, usually in the form of some curious object, and the Detectives then research it, bringing the audience along. Then, when the mystery is solved, they present the answer to the person who proposed it, and record their dramatic reaction, live. They hope to record an awestruck indication of, either, disappointment, or surprise, sort of like when on the Roadshow, the owner of the object brought in for appraisal finds out that their antique is worth, either, absolutely nothing, or a mindboggling fortune! Each outside participant in the show, is kept in the dark, as to what preceded their involvement, as well as what comes after it. That is, until the episode is aired. God knows how Wes found me, but he sure came to the right place! 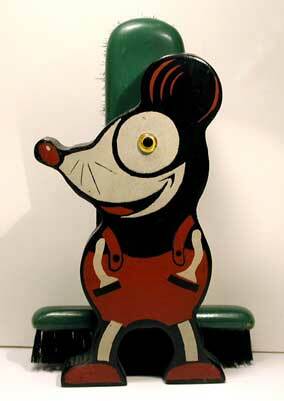 The mystery this time was a small wooden mouse toy, made by the Performo toy company, of Middletown Pa. It happened to be a toy that I know well. 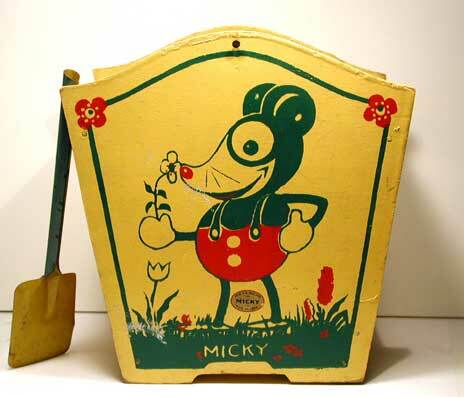 On his chest there is a decal that reads, “MICKY,” without an “E,” and on his foot, anther decal proclaims that he was patented in 1926. 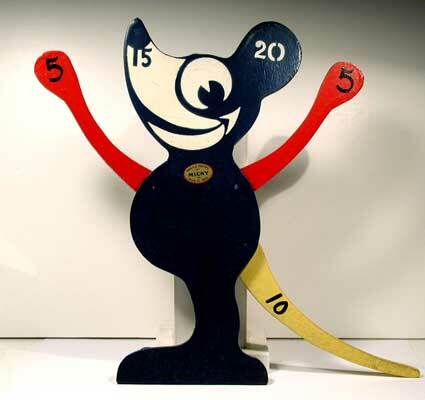 He had been presented to the show as possibly the true origin of Disney’s Mickey Mouse, who was officially introduced in 1928. 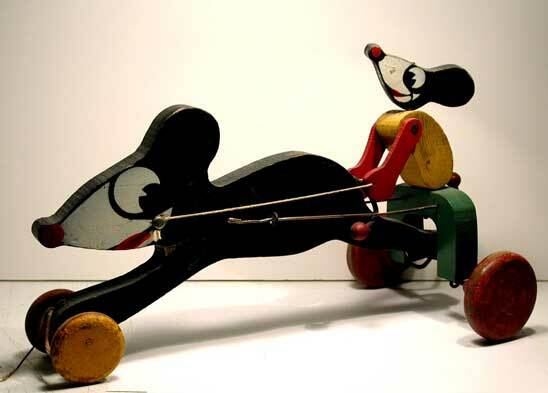 And although, even the creator of this toy, a man named Rene Grove, apparently, all his life, believed that Disney had seen his wooden MICKY sold at a train station in PA, on his way back to LA after losing Oswald, and thus, had stolen Mickey Mouse from him, I knew that this was not the case. I explained to Wes that mice who looked exactly like Mickey Mouse had populated every one of Disney’s Alice Comedies, beginning in 1923. And all one had to do to see the proof, was open any book on early Disney. 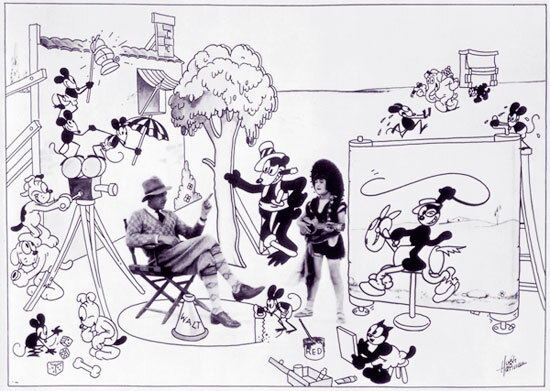 They would see images like this one, on page 40 of “The Art of Walt Disney,” written by Christopher Finch, in 1973. Alas, just opening up a book did not make for interesting TV. Wes asked if he could come and visit me. 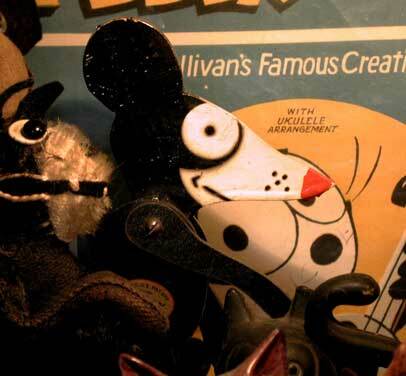 We spoke on the phone a lot, over the next few days, and I fortified the case for Disney with other examples, from Krazy Kat to Felix, all having mice similar to both MICKY and Mickey, and predating each. At any rate, I probably have more early Performo Mickys, than anybody, outside of the Middletown PA Historical Society. Here is the “flat” version. It looks even less like Disney’s Mickey. And here is the more dimensional one, the toy in question on the show. There is also a brush set, a pull toy, a ring toss game, and a sand pail. Along the way, Performo’s mouse got a pair of pants like Mickey, with two buttons, strangely placed. A week later, Wes and his camera crew arrived, and to my surprise, they had just one camera with them. I was fascinated to discover that each scene had to be repeated twice, so it could be edited to look like just one conversation, alternating from two points of view, the speaker’s and the listener’s. And I was somewhat scandalized to learn that the whole thing had been completely scripted, ahead of time. The writers had predetermined, with awkward touches of misinformation, everything that I was supposed to say, based on our previous phone conversations. Naturally, I balked at this situation, and refused to cooperate. This threw them for a loop, but we worked around it, and in the end, I said what I wanted to, and spoke the truth. When I saw this aired on TV, weeks later, and discovered that the mystery had been brought to them by an old-time collector, Jeff Kane of San Francisco, I laughed so hard I fell off of my chair. The Micky Detectives had been hoodwinked! This looked to me like Jeff’s disingenuous attempt to get his face on national TV? I have known Jeff for 45 years. 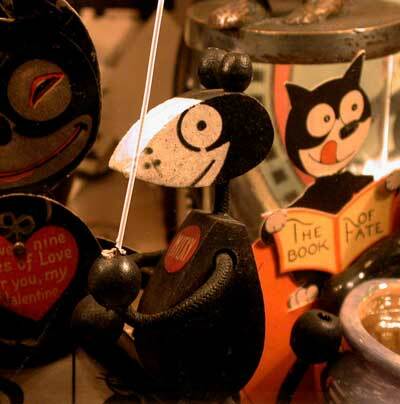 He was one of the first Mickey Mouse collectors, perhaps the only one in San Francisco in 1970. He was also a dealer, and I have purchased several Mickey and Minnies from him, over the years. If anyone would have the knowledge and expertise to know full well that this MICKY toy was not the origin of Disney’s Mickey, it would be he.